Centuries of history marked by violence, tragedy and death make Boston one of the most haunted cities in America. On your next Boston vacation, stop in at some of the places that are most famous for their supernatural experiences and discover for yourself if ghosts really do exist. 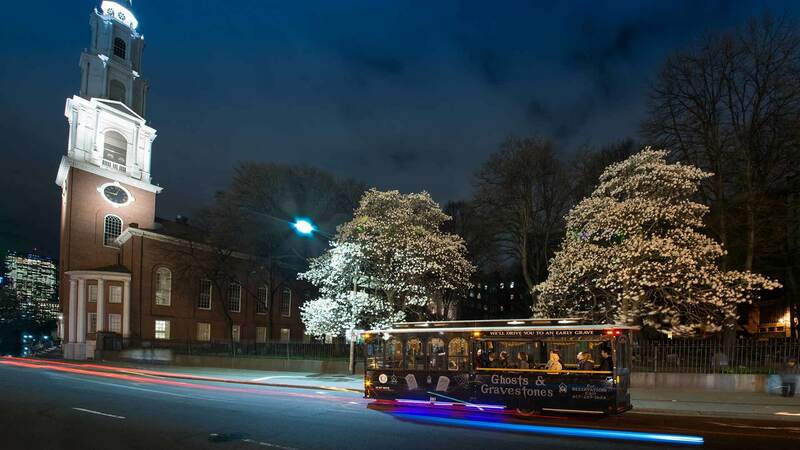 Boston’s most frightful evening of fun is aboard Old Town Trolley’s Ghosts & Gravestones Tour. The “frightseeing” begins the moment you climb onto our ghoulish trolley where our gravediggers are waiting to take you on the 90-minute ride of your life. 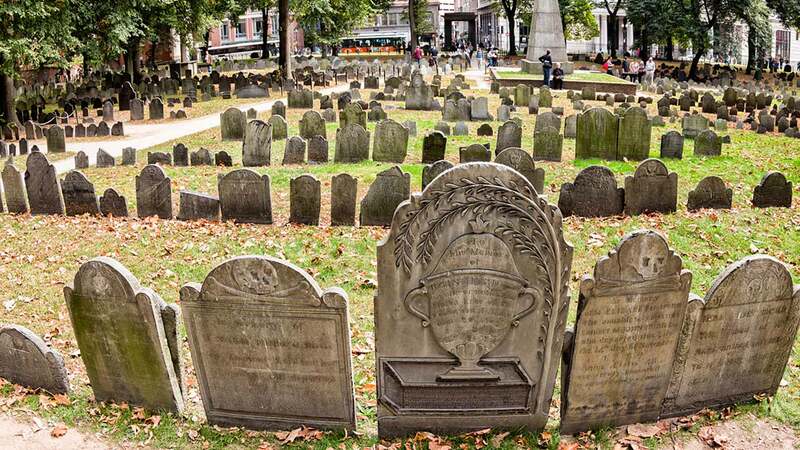 Be prepared to be scared as the Ghosts & Gravestones trolley winds its way through Boston’s most sordid past—through 400-year-old burial grounds where you’ll hear tales of grave-robbing, tortures, punishments, executions and even some folks being buried alive! 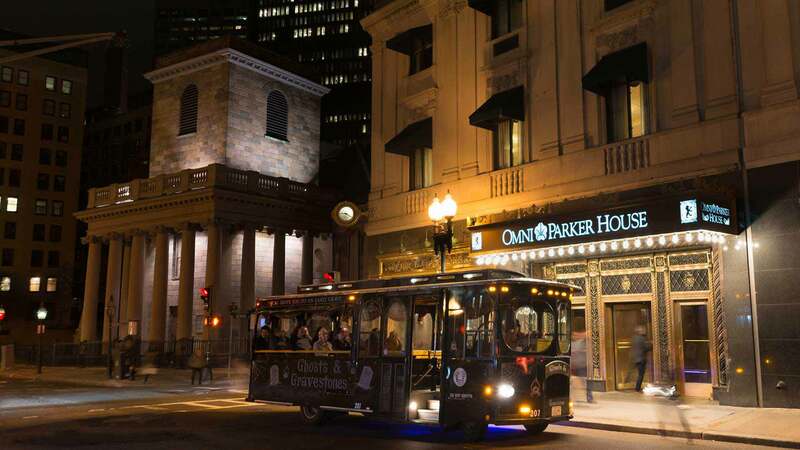 You’ll see Boston’s most haunted hotel: The Omni Parker House, and visit some of the sites of the most gruesome murders in Boston’s History. 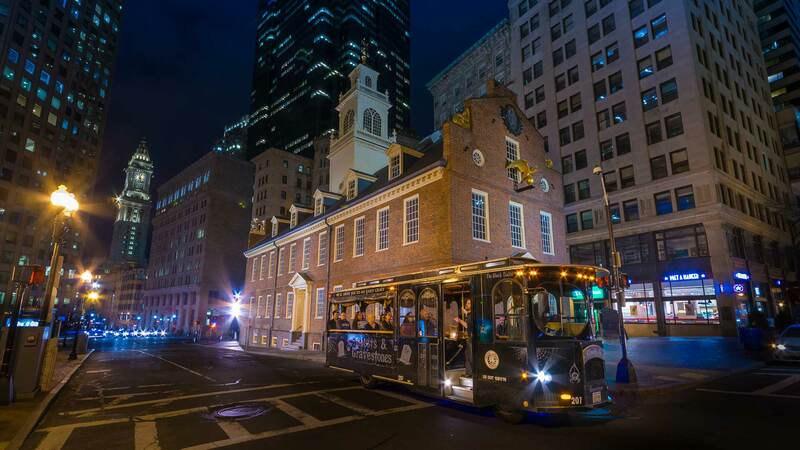 Hear the terrifying tales of the Boston Strangler, Jolly Jane, Cotton Mather and join us if you dare as we explore Boston’s most chilling murder sites and haunted places. Built in 1903 and located at 219 Tremont Street in Boston Common, the Cutler Majestic Theater has a varied past and has changed venues several times throughout its existence. When it was purchased and restored in the 1980’s, every theater major at the university was required to do some sort of work there. Many of those students reported ghostly experiences, including seeing the ghost of a former Boston Mayor still sitting in the seat he died in during a performance. Others, including theater patrons, told accounts of seeing the spirits of a couple and their young daughter floating about in the upper balcony. Built in the 1840’s, this stark granite fort sits on George’s Island at the entrance to the Boston Harbor. It’s here that Confederate Soldiers and disloyal citizens were imprisoned during the Civil War. Their most famous inmate was Alexander Hamilton Stephens, Vice President of the Confederate States of America. The island and the fort were known for harsh conditions and Union Soldiers reported seeing shadows and experiencing strange sensations of being watched while they patrolled the beaches. But Fort Warren’s most famous ghost is still the Lady In Black, Mrs. Lanier, who has been sighted many times as she wanders about the grounds. Her tragic death came when she traveled from Georgia to free her husband who was imprisoned at the Fort. After an arduous journey, she got inside the prison and managed to be reunited with her husband. During their escape attempt, they were discovered by a guard who knocked the pistol from her hand, which fired, hit and killed her husband on the spot. Mrs. Lanier, was subsequently hung and buried on George’s Island in the black robes she still wears today. Next stop, third floor (the floor once occupied by Charles Dickens). One of the most chilling tales about Boston’s Most Haunted Hotel is the fact that the elevator has been known to stop at the 3rd floor without anyone pushing the button. When the doors open, no one is there. The Omni Parker House Hotel exudes poltergeist-like personality. It’s here that the owner of the hotel, Harvey Parker, has been seen roaming the halls of the 10th floor. Reports from guests throughout the years describe Mr. Parker perfectly, and include sightings of him inside rooms, in the hallways and even sounds of someone rocking back and forth in a rocking chair—especially eerie since there are no rocking chairs in the hotel. The Hotel’s history dates back to the middle 1800’s and since then many who have stayed there have told of lights flickering on and off, hearing voices when no one else was in the room and apparitions of lost souls, dressed in attire that dates back to the 19th century. Built in 1839 as an inn for pilots and captains of ships that were on overnight stay in Boston, the Pilot House is now home to several spirits including the Lady in White. This apparition is said to linger in the kitchen on the first floor and those who have seen her say she appears like a glowing figure, almost translucent. Others who have visited the Pilot House have also heard the disembodied voices of men talking, clinking glasses and laughing and have observed doors slamming when no one was around. And is the final resting place of Samuel Adams, John Hancock and Robert Treat Paine, three of the signers of the Declaration of Independence. Paul Revere is also here—and his spirit is said to be lingering as well, sometimes upon the horse that he made his famous midnight ride on. Spooky and somber, the graveyard is a sight to see with its winding narrow pathways, picturesque trees and imposing iron gates that mark the entrance. And for those hoping for a paranormal encounter, there have been many reported. From the eerie feeling that someone is lurking over your shoulder, shadowy figures, glowing orbs and ghostly faces that appear in photographs, to the chilling sensation that visitors get while viewing the tombstones of the five victims of the Boston Massacre and the many other famous Bostonians buried here, lost souls, specters and spirits of the dead are abundant in this ancient cemetery – definitely worth a visit for any ghost enthusiast!